Come to the doctor's office prepared with your top three concerns and questions, medical experts advise. (CNN) -- During his dermatology rotation as a medical student, a professor proclaimed to Dr. Paul Konowitz that there were two dermatologic problems you especially never wanted to develop. Konowitz can't remember the name of the first one, but the second one was pemphigus vulgaris, an autoimmune disorder where painful blisters appear on mucous membranes throughout the body. Decades later, Konowitz developed pemphigus. "Imagine that feeling when you burn your mouth on hot pizza. Now magnify it by about 100," he said. "The lining of my nose, throat and mouth were basically just sloughing off." To make matters worse, because he had to take drugs that suppressed his immune system, Konowitz also developed herpes sores up and down his esophagus. He made an appointment with a gastroenterologist and had high hopes that he might find some relief from his treatments. But something strange happened at that doctor's appointment. "My wife and I talked to the doctor for about 15 minutes, and then he just kind of got up and left the room. The appointment was over," Konowitz remembered. The doctor had given the Konowitzes no treatment plan, no directions, no suggestions, no nothing. "My wife and I looked at each other and said, ''What was that all about?' We didn't know anything more than when we went in." If Konowitz, an otolaryngologist at Massachusetts Eye and Ear Infirmary in Quincy, and his wife, who's also a physician, can leave a doctor's appointment scratching their heads, that means you can, too. Because doctors are often rushed these days, patients must come to appointments utterly prepared, Konowitz advises. "Maybe it would have helped if at the beginning of the appointment I'd said I needed a clear plan of what to do," he told me. "We needed a plan, next steps and a time frame for what to do if I didn't get better." Sherrie Kaplan, associate dean of the Department of Medicine at the University of California, Irvine, agrees. She calls it practicing "planned patienthood." 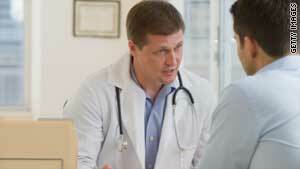 "Most of us go unprepared to an appointment," Kaplan said. "We show up and say, 'Doctor, take good care of me.' "
Kaplan says "planned patienthood" means taking an active role, thinking through before you even step foot into the doctor's office what you want to get out of the appointment. Here are five steps to achieving "planned patienthood" so you can get the most out of the time you have with your doctor. Writing down your concerns helps you make sure you won't get sidetracked during the appointment. Although you might not get to all three of your concerns in one visit, at least you'll know what needs to be addressed at the next appointment. "Patients should prioritize their list," said Larry Mauksch, senior lecturer at the University of Washington Department of Family Medicine. "The thoughtful physician will quickly determine if it is realistic or not to address all the problems in one visit." As part of a study, Kaplan tape-recorded patients at their doctors' appointments and counted the number of questions they asked. On average, the patients asked only five questions per appointment -- and that included "Where's the bathroom?" and "Do you validate parking?" It's understandable that patients ask so few questions. "Doctors are increasingly on a time-pressured schedule, needing to be efficient because that's how our system rewards people these days. So when the doctor asks at the end of a visit if you have any questions, he's looking at his watch, and the waiting room is full of people, so you know the answer is, 'No,' " Kaplan said. But she advises that you should insist on having your questions answered. In studies in which Kaplan coached patients on how to plan their appointments and asked better questions, their health outcomes improved. Does your treatment involve drugs? A change in diet? Physical therapy? Write it all down, and repeat it to the doctor to make sure you've understood her correctly. "If some aspect of the plan does not make sense or is not feasible or attractive, this would be the time to tell the physician," Mauksch advised. Once you've done step No. 3, you need to ask yourself what the very next thing is that you need to do to put your treatment plan into action. Do you need to get a prescription filled? Schedule a follow-up appointment? Call a specialist? Make sure you have your marching orders before you leave the doctor's office. This is a crucial part of the process. I know because I once forgot it. When my oldest daughter had her first ear infection as a baby, our pediatrician prescribed an antibiotic for 10 days. A day passed, then two, then three, then four, and she wasn't getting any better. After five days, I brought her back into the pediatrician's office. He looked in her ears, and they were still infected, so he prescribed a different antibiotic. "Call me in two days if this one isn't working," he instructed. I was dumbfounded. Antibiotics are supposed to work in 48 hours? Yes, the pediatrician explained; usually you see some relief in that time. I didn't know this, so I didn't know to bring my baby back in after two or three days. I thought a 10-day prescription for antibiotics meant it would take that long for them to work. Now, whenever anyone in my family is prescribed a medication, I make sure to ask how long it's supposed to take until it works. If that time passes and he or she is still sick, I go right back to the doctor. As for Konowitz, he later called the doctor, who seemed unsure about what to do for his herpes. Konowitz asked the doctor to confer with his colleagues and ask for their suggestions. Eventually, the herpes sores went away, but Konowitz will never forget that useless doctor's appointment. CNN's Sharisse Scineaux contributed to this report.